The Four Points by Sheraton Houston Greenaway Plaza is centrally located in the heart of Houston, between the Galleria and downtown Houston. We have 216 spacious guest rooms, each with two telephones, coffee maker, hair dryer, iron/ironing board, complimentary bottled water and a USA Today (Mon-Fri).Some of our features include a sparkling outdoor pool, 24 hour fitness center, complimentary business center, as well as our full service restaurant and bar, Upper Kirby Tap Room - available for both breakfast and lunch, and room service for when you prefer a more private dining option. Our free high speed wireless internet throughout the hotel - including guest rooms, public areas, and our meeting space, is another treat your guests are sure to love.There is plenty of shopping, restaurants, and nightlife in the nearby vicinity. And for your convenience, use our complimentary shuttle (within a 3 mile radius), based upon request and availability.For your enjoyment, we are minutes from Toyota Center, Minute Maid Park, Reliant Center & Stadium, George R. Brown Convention Center, the Museum District, IMAX, Houston Zoo & many Golf Courses. MAGC - Make a Green Choice. For every night that you stay (NOT including last night) and choose not to get your room cleaned, you will be rewarded with extra SPG (Starwood Preferred Guest) points OR a $5 voucher for our restaurant. Hotel Features – Fresh off a multi-million dollar renovation, the Four Points by Sheraton Houston Southwest boasts renovated guest rooms, plenty of meeting space, and all the amenities you’ll need for a comfortable stay in Houston. For business travelers, there’s a 24-hour business center that offers computers, high-speed Internet, as well as copying and faxing services so you can stay connected during your entire trip. Guest Rooms – For your convenience, all guest rooms are smoke-free. They’re designed for your comfort with amenities such as plush bedding, a 27-inch television with in-room movies and video games, a phone with voicemail, refrigerator, coffee and tea maker, and wireless high-speed Internet access. If you’re travelling with young ones, cribs and rollaway beds are available upon request. Nearby Attractions – Centrally located between downtown and the Galleria mall, Four Points by Sheraton Houston Southwest is a short drive from the Houston Museum of Fine Arts, the Children’s Museum of Houston, Houston Zoo, Astroworld, and Wortham Theater. For recreation, you’ll be less than five miles from two challenging golf courses, and just minutes away from a wealth of shopping opportunities. Perks & Amenities – As a guest of the hotel, you can take advantage of a business center, fitness facility, outdoor pool, and wireless high-speed Internet access in public areas (for a small fee). For your convenience, there is a 24-hour front desk, babysitting services, and self-parking facilities at the Four Points by Sheraton Houston Southwest. Expert Tip – When it’s time for a bite to eat or something to drink, you don’t even need to venture outside the hotel doors. The 2828 Lounge serves up tasty beverages, while the Four Points Restaurant serves a selection of American casual fare from 6 a.m. until 11 p.m. every day. Local Shuttle Info: Hotel courtesy shuttle runs weekdays from 6AM-10PM in a 3-mile radius of the hotel. Reservations are preferred at the front desk. Our Full Breakfast Buffet is $14 per person - Ages 8 and older. Children aged 5-7 are $7. Children 4 and under are free. PLEASE NOTE: Prices DO NOT include tax or gratuity.Ala Carte items are available for purchase off menu. WI-FI is complimentary in our guest rooms, public areas, and meeting space. 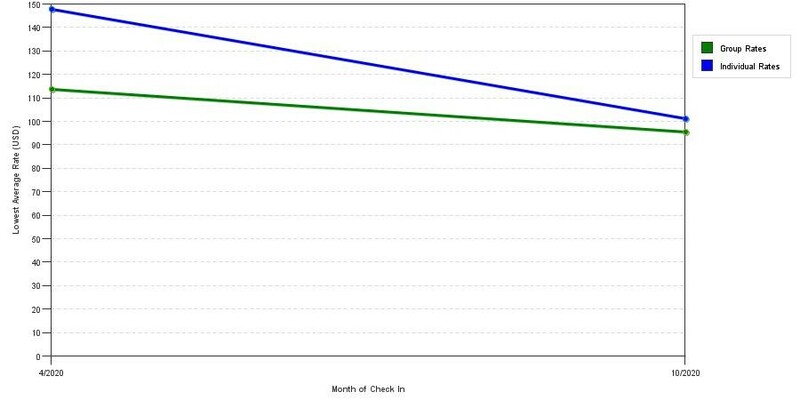 The graph above is fluctuations of room rates for both group rates and the lowest online individual prices our system could find at the time the group bid was placed. The lowest group/meeting rate displayed is 80.2% in the month of January 2018 and the highest average individual rate is $449 in the month of March 2018. This chart will show past seasonality and also project future months. If you are flexible with dates, you may want to consider staying at Four Points by Sheraton Houston Greenway Plaza in a month when rates are lower. Below are the meeting, banquet, conference and event spaces at Four Points by Sheraton Houston Greenway Plaza. Feel free to use the Four Points by Sheraton Houston Greenway Plaza meeting space capacities chart below to help in your event planning. Hotel Planner specializes in Houston event planning for sleeping rooms and meeting space for corporate events, weddings, parties, conventions, negotiated rates and trade shows. 70 x 27 x 12 Ft.
45 x 27 x 12 Ft.
25 x 27 x 12 Ft.
29 x 16 x 12 Ft.
10 x 18 x 10 Ft.